Could perennializing potholes reduce nitrate losses? Are wet spots hot spots for nutrient loss? That is the question Steven Hall will be addressing in the ILF Webinar Oct. 17, and it is one that interests me greatly. What I really want to know is, if wet spots are hot spots, what can we do to cool them off? And boy with all the precipitation, 2018 was a great year to test these questions! Steven is part of a team of researchers, extension specialists, farmers, and farm groups digging into the economic and environmental performance of farmed potholes. As Iowa State University’s Extension Biomass Crop Specialist, I help this team learn if we can improve profit alongside water and nutrient cycling by incorporating perennial biomass crops into farmed potholes. So, what are biomass crops? Biomass crops are those harvested for their whole above-ground biomass, not just grain or fruit. The only perennial biomass crops widely grown in Iowa today are forages such as (give examples), but that could change as plants are increasingly used to replace things we get from petroleum today. For example, the University of Iowa is replacing coal in their power plant with the perennial grass miscanthus (Miscanthus x giganteus), grown on ~2,500 acres in the Iowa City area (Fig. 1). The UI expects miscanthus to provide about 10% of the entire university’s heat and power load within the next few years. As those of us rooted in the prairie Midwest know, perennials have deep root systems that hold soil and clean water. They also require less fertilizer and fossil fuels to thrive and only have to be planted one time! Because of this, their carbon footprint can be considerably lower than the annual crops we currently use for energy, like corn ethanol and soy biodiesel, and there is growing demand for them. Perennials also tend to be more resilient than annuals, including tolerating drought and flood stress that would kill an annual (Fig. 2). Fig. 2. Looking north (top) and south (bottom) at a farmed pothole on the ISU Sorenson farm July 3, 2018 (left) and Oct. 12, 2018 (right). The pothole flooded multiple crops (from top left in top photo: cool-season grass CRP, miscanthus, corn, miscanthus, soybeans, sorghum) multiple times this year. The soybeans and later the corn, were a complete loss. The perennial CRP survived and miscanthus thrived, due largely to growth habits and established roots. Photo credit: Emily Heaton and Nicholas Boersma. – Could we get feedstock for low-carbon fuels and products by planting crops like miscanthus in farmed potholes? – Can farmers make more money with a resilient perennial in potholes instead of corn/soy? – Would planting perennials in potholes change the amount and quality of water leaving farm fields? We are hoping to find the answer to these questions, and discover new questions to ask, in several experimental plots we’ve established near the ISU campus (Fig. 3) as parts of a USDA NIFA grant and a Dept. of Energy grant. We will be monitoring ponding depth, water quality, greenhouse gas emissions and crop growth in experiments with separated and controlled tile drainage systems (white lines in top left of Fig. 3) as well as in “natural” farmed potholes (red outlines). In both cases we will test both corn/soy and miscanthus, along with the annual crop sorghum, which seems more resilient to environmental stress than corn. Fig. 3. New ISU experiments will assess perennial and annual crop impacts on potholes using controlled drainage experiments (top left; white lines are tile maps) and monitored potholes (bottom right, red lines are ponding outlines) near Ames, Iowa. To learn more about this exciting research, listen to Steven’s webinar on Wednesday. I know Steve will welcome your questions or insights into what we are doing. And then, in a year or so, once the sites are really established and we have data to share, we will be having public field days. Keep your eyes on this blog to know when and where! Participants at the August 9th field day in Spirit Lake were treated to burgers, information and one spectacular view. Over 50 people attended the Wetland, Saturated Buffer and Bioreactor Field Day hosted by Prairie Lakes Conference and Dickinson County Soil and Water Conservation District. They came to learn how edge of field practices like wetlands, saturated buffers and bioreactors are key to reducing nitrate loss from agricultural land in Iowa. However, they stuck around long after to take pictures and to discuss about how beautiful the project had turned out. Golfers can be seen in the distance playing a round at the Okoboji View Golf Course. One key stakeholder who participated in the wetland restoration project was the Okoboji View Golf Course, which sits right behind the project. Staff from the golf course led a discussion about their experience and the economic upside to the project. “We have actually seen an increase in our business as a direct result of the project. It is very beautiful to be out here,” explained a staff member. The Spirit Lake restoration project really is the perfect example of public and private stakeholders coming together with a shared goal. It is also a great example of a project bringing urban and rural issues together. It’s a win-win for everyone involved, especially the lake. How will nitrogen reductions economically benefit Iowa? Watch the Iowa Learning Farms webinar on July 18 at 12:00 p.m. with Dr. Chuan Tang to learn how he and his fellow researchers are examining the economic benefits of nitrogen reductions in Iowa through the exploration of the costs of high nitrates and how meeting the Iowa Nutrient Reduction Strategy goals will be beneficial for all Iowans. Dr. Chuan Tang, postdoctoral research associate with the Center for Agriculture and Rural Development, is exploring the costs of high nitrates in Iowa’s drinking water sources including public water supply systems and private wells. The study also analyzes the recreational benefits of meeting Iowa’s Nutrient Reduction Strategy targets. “The state of Iowa is currently grappling with designing the best policies to address nitrate pollution in the state. This webinar will discuss an important aspect of this discussion – the benefits of nitrate reductions to all Iowans,” commented Dr. Tang. Dan Jaynes, Research Soil Scientist with the National Laboratory for Agriculture and the Environment (USDA-ARS), hit the high points on saturated buffers last week in the latest Iowa Learning Farms webinar. Watch the archived version now. Saturated buffers can divert about half of the water coming out of a tile outlet (red bars). From this diverted water, the practice can remove between 8-84% of N (blue bars). Saturated buffers costs about $1 per pound of N removed. The practice ranks similarly to other nitrate reduction edge-of-field practices. A comparison table is shown below. See the most recent conservation practice standard for a saturated buffer here. Watch the presentation to hear the discussion on specific changes. Saturated buffers should be designed to treat 5% of the drainage system capacity, or as much as is practical based on the available length of the vegetated buffer. To determine the drainage system capacity, use this excellent tool from the Illinois NRCS. Option 1 (determining capacity using slope and diameter) is the most common option used if limited information is available on the drainage system. Are we trading a water quality problem for an air quality problem? Does denitrification account for all of the nitrate lost? How wide should the buffer be? What should the buffer vegetation be? What about multiple distribution pipes? What about roots plugging distribution pipes? On the issue of whether roots plug distribution pipes, Jaynes says that, generally, the answer is no. For a more in-depth look, here is a great video of a look inside a saturated buffer distribution pipe. To learn more about site suitability for saturated buffers in your local area, explore the ACPF Saturated Buffer Viewing Tool. The suitability of an area in central Iowa is included below. This can be a great tool to determine potential saturated buffer sites (followed by a trip to ground-truth site conditions). If you want to learn the latest information about saturated buffers, tune in to the archived webinar! 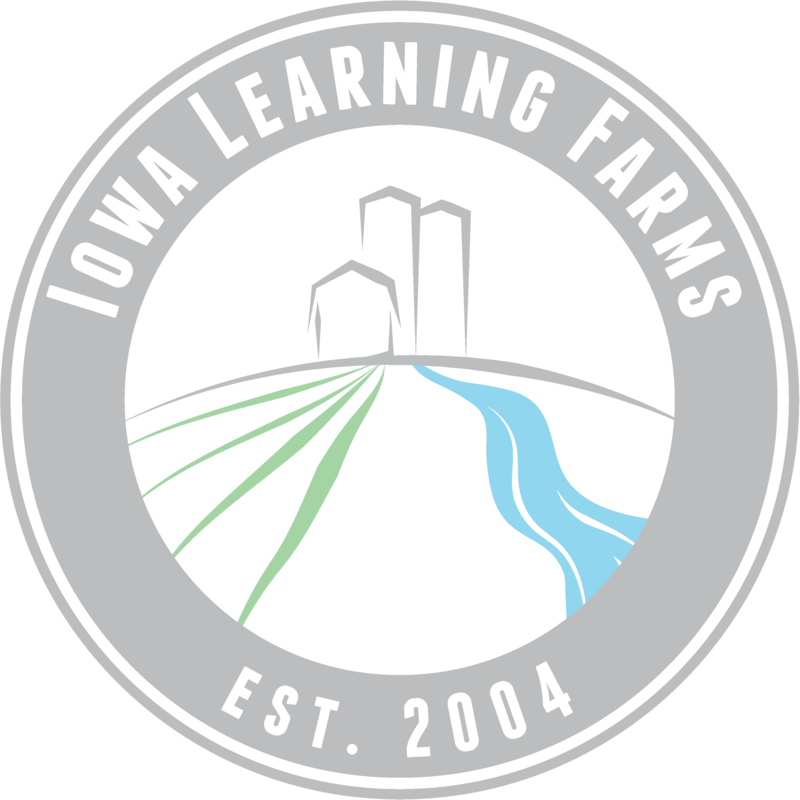 Watch the Iowa Learning Farms webinar on April 18 at 12:00 p.m. to learn more about the latest research, installation standards and best management practices for saturated buffers. Dan Jaynes, Research Soil Scientist with the National Laboratory for Agriculture and the Environment (USDA-ARS), will share research results from several saturated buffers and will cover some of the recent changes in the practice standard. Don’t miss it! Last week, Dr. Laura Christianson joined us for our monthly Iowa Learning Farms webinar. Christianson has nine years of experience focused on agricultural drainage water quality and denitrification bioreactors for point and nonpoint nitrogen treatment. Laura’s experience with bioreactors over the past nine years has led her to study bioreactors with many shapes, sizes and designs. She authored in a meta-analysis on bioreactors that synthesized existing research. Water should be retained within a bioreactor for a minimum of six hours. Great visuals and an explanation are covered in the webinar. There was no significant difference in N removal when using different types of wood (hardwood vs. softwood) in a bioreactor. However, the physical properties of the wood matter. Use chips with particles size between ½ inch and two inches instead of shredded or mulched wood. Future research on bioreactors is moving us beyond the first generation of bioreactors. Plastic baffles in the bioreactor route the water through the woodchips so all woodchips are utilized in the denitrification process. Two bioreactors are installed side-by-side. One serves as the primary bioreactor, and bypass water from the primary bioreactor is routed to a second bioreactor to continue N removal on bypass water that would normally not be treated. For areas with ditch drainage, the bottom of the ditch is excavated, woodchips are placed, and wooden check bands are installed incrementally throughout the length of the treated ditch bed. Water is routed through a phosphorous-absorbing filter prior to its entry into the bioreactor. If you would like to brush up on your bioreactor knowledge, don’t miss this webinar!